This 2 x 300 mm Horizontal Arm allows the Flexible Server Module to be perfectly fixed, oriented and adjusted. It is coated with an anti-microbial agent offering hygiene and cleaning down to the last detail. Its modern design has been specially designed for healthcare environments. 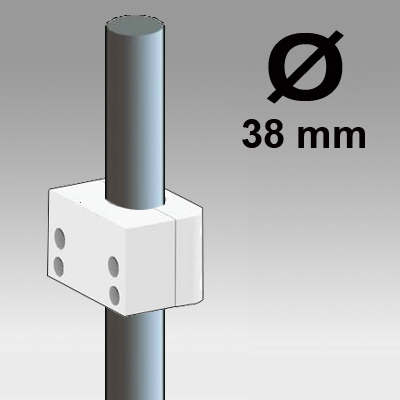 * Mounting on 38 mm fixed pole, fixing ring included. fixed pole 38 mm and then adjust to the pole. It has no height adjustment. Philips Series Server Module). Rotary head. * Philips FMS rotation: 115° right, 115° left. * Arm rotation: 105° to the right, 105° to the left. Note: Please specify Philips FMS type when ordering. a revolutionary treatment that guarantees optimal hygiene. IT medical arms integrate Microban and other antibacterial agents into all medical products. It inhibits the growth of bacteria of all types. This is not a surface treatment. It is 100% in the totality of the product. It does not alter the physico-mechanical properties of the medical arm lift system. Simulations over 30 years show that 100% of the antibacterial properties are maintained.